Comet 67P is fluffy and very low density. A fluffy space rubber ducky? Comets are weird. They’re similar to asteroids—chunks of very old material orbiting the Sun, rough-hewn and in many ways primordial—but while asteroids are usually mostly rock or metal, comets have minuscule amounts of metal, and are mostly rock and ice. This makes them much less dense than your typical asteroid. Hold a chunk of comet in one hand, and a chunk of asteroid in the other, and the asteroid will feel much heavier. Typically, comets are less dense than liquid water. When water freezes into ice it forms crystals and expands, making it slightly less dense than when it’s a liquid (which is why ice floats). But studies of comet densities show them to be even less dense than that! Given that there’s rock mixed in them as well, that’s a tad weird. How can they be so low density? There are two ways. One is that perhaps they’re fluffy, powdery, and not like a solid chunk of material. Another is that maybe they have cavities in them, holes, so that overall their density is lower. Which is it? For the comet 67/P Churyumov-Gerasimenko, now we know. It’s fluffy. 67P is the comet that has been orbited by the Rosetta probe since August 2014. 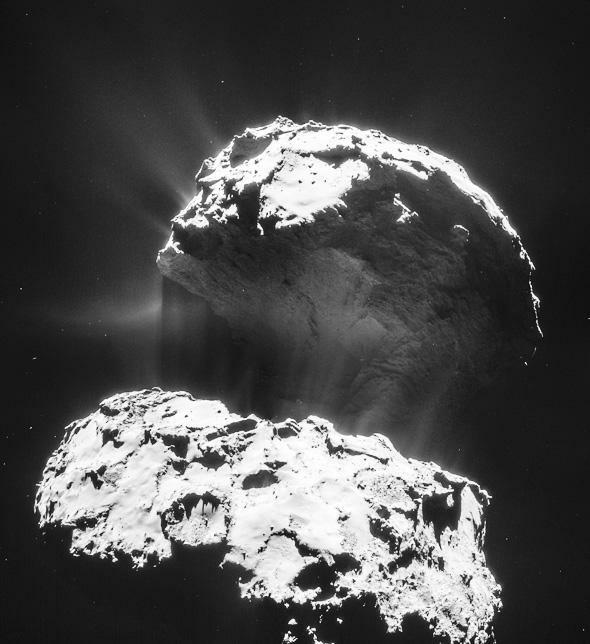 We’ve seen tons of gorgeous photos, of course, but Rosetta is doing a lot of science while it’s at the comet. Most of that science is performed using fancy equipment, but some of it is done just by the fact that the probe is there, moving around the comet itself. The comet may be low density, but it’s big, several kilometers across, and has gravity. It tugs on the probe, very gently, and that’s the key to getting its density. If the comet has cavities in it, then the gravity the probe feels will change as it moves around; if Rosetta passed over a part of the comet that had a cavity, the gravity would drop a wee bit, because there’s less mass pulling on the spacecraft. The velocity of Rosetta would change a very tiny amount. If the comet is fluffy but relatively homogeneous throughout, the gravity field would be smoother, and the probe’s velocity wouldn’t change as much. We’re talking incredibly small amounts of change in speed though. How do you measure them? Doppler shifts! As the probe moves around the comet, it’s sending back radio waves to Earth. The wavelength (or frequency if you prefer) of the radio waves changes a little bit depending on whether the probe is moving toward or away from us as it moves around the comet, and that can be measured very precisely. So precisely, in fact, that scientists back on Earth had to account for ridiculously small effects that could change Rosetta’s velocity, like the gravity of all the planets and large asteroids (even though they’re many millions of kilometers away), and even the incredibly small pressure exerted by the solar wind. But this sort of thing has been done for years with space probes, and the team is confident they have now been able to account for them. And when they do, they see no shifts in Rosetta’s speed due to cavities in the comet. That means it must be homogeneous, with no big empty regions inside. That’s pretty neat! Without ever touching the comet, we can figure out what its interior is like! We can also determine its density, which turns out to be very fluffy indeed, about 0.53 grams per cc. Water is 1 gram per cc, and even ice is about 0.9. Given that 67P has rock in it, this means it’s packed together very, very gently. Still, it’s a huge thing. The volume of the comet is 18.7 cubic kilometers, equivalent to a cube 2.5 kilometers on a side (though the comet itself is shaped more like a giant rubber ducky). That means its total mass is 10 billion tons. These are probably the best and most accurate measures of a comet’s gross properties ever made. I have to sit back and smile when I think about that. That’s amazing. We’ve been studying comets for centuries, and in the past few decades have managed to visit a few (actually, nine!) with spacecraft. Until Rosetta, those were all quick flybys (and one impact). Now, with a probe orbiting one for well over a year, we’ve learned vastly more. We know how it formed. We know what material is in it. We know its surface morphology (including vents, pits, cracks, terraces, cliffs, landslides, and even wind-blown structures). We know that parts of the surface are structurally tougher than others. And now we know its volume, mass, and density. All of these facts will help us understand these enigmatic objects, and that in turn gives us insights into how our solar system formed, and how it’s changed over the past 4.6 billion years. That’s a pretty good haul for sending one probe to one object. I hope it’s just the start. Imagine what we could do with a fleet of them.